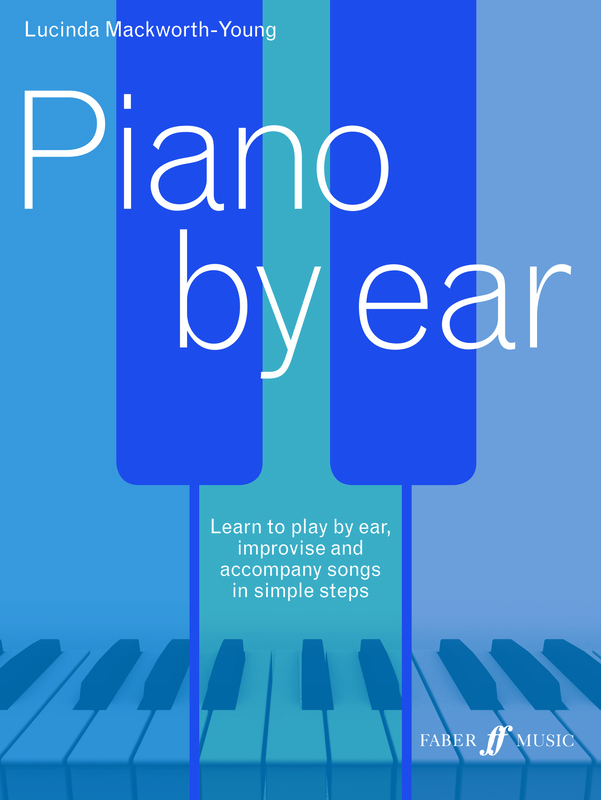 Piano by Ear is written by Lucinda Mackworth-Young, and published by Faber Music. It’s released for sale TODAY! So one lucky competition winner will have a hot-off-the-press copy. 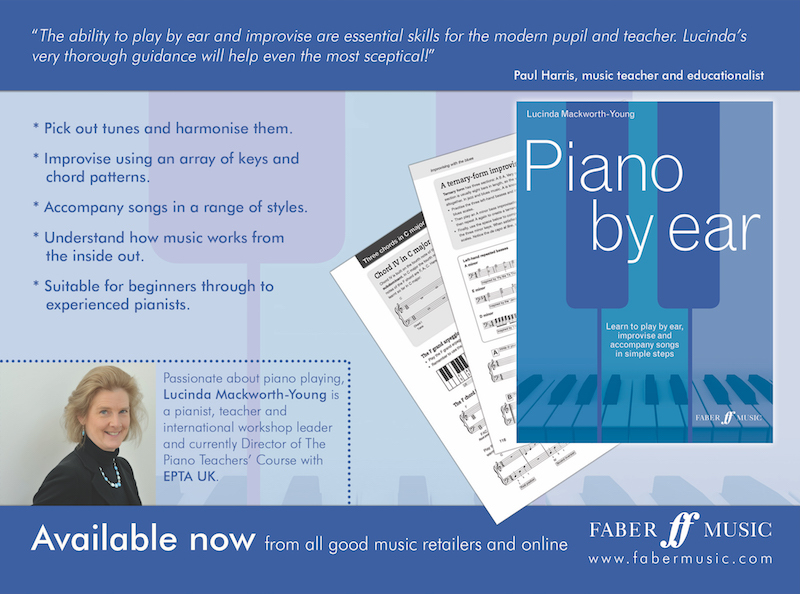 Lucinda has written a very detailed and practical book designed to help pianists of all ages and all standards (although probably for those of Grade 3/4 or early Intermediate level and above) become confident playing by ear. 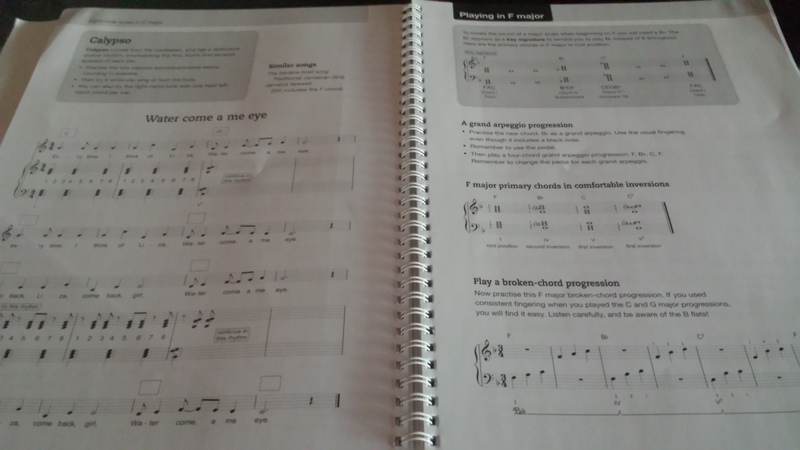 The book is in a workbook style format (see photo below), taking pianists through suggested improvisations, accompaniment for songs, and ultimately playing by ear. It’s perfect for those preparing for the ABRSM Practical Musicianship exams. There are over 125 useful pages full of suggestions, ideas and logical, practical help. Certainly a beneficial volume for teachers and students everywhere. I have one copy to give away, so as usual, please leave a suitable comment in the comment box at the end of this blog post, and I will select a winner on Sunday evening (British time). Good luck! Alternatively, you can purchase a copy here. Playing by ear is an invaluable skill that allows the musician to explore freely on their instrument. We often get so caught up in the notes that we lose the music. What a wonderful publication! Piano by Ear is an awesome idea for very little childrens I think. The goal of this new publication is like a ray of sunshine after the rain learning the piano far from being dreary and austere and becoming entertaining and appealing. My little piano-pupils of Propaedetics Courses in Ferrara Conservatory in Italy will play all with pleasure and satisfaction. Well Done !!! looks like a great resource, one I’d love to get my hands on. Looks like this will be added to my shopping list! Thanks, Melanie, for bringing great resources to our attention. I leafed through the preview for the Kindle edition of this and am impressed. It looks like it covers a lot of the things that I illustrate in words and playing examples but have never gotten around to writing down in any orderly fashion. It would sure be better to have this as a textbook than for my students to be reading my chicken scratch slap-dash notes! thanks for the heads-up on this. This is on my (very long) wish list. I have many students who either want to play by ear so a book committed to the learning of such a concept would be very useful. I must confess that it is a limitation of mine – after playing by ear a lot as a child I suspect my ear was stunted by previous music teachers who didn’t help me develop it. Now I have the opportunity again! Some years ago I almost felt crippled when I co-founded a band in which nobody would be using sheet music. (Synthesizers don’t have music stands anyway!) The term ‘steep learning curve’ hardly does it justice. I’d say this book would have been a great help, had it existed. Lucina’s approach is invaluable to teachers wanting to teach in a holistic way. Her resources develop the pupil’s musicianship in a creative and fun way. I’m looking forward to seeing her latest collection. I would love to be able to have this as a resource for my students. Although I teach mostly traditional classical music, the ability to play by ear, and improvise is critical to overcoming performance anxiety. And to learn to be creative is very freeing! What a great idea for a book – an excellent step by step approach for a topic that so many students will find easy to follow. I have three students in mind immediately that I would love to show this to, so they can purchase it themselves too. It will certainly help me to structure lessons with an approach that fits in well with my style of teaching. Good to see it also available easily for purchase in the UK. Would love to win this – thanks so much Melanie for the opportunity! I had the pleasure of studying with Lucinda on the EPTA Piano Teachers Course this year and she was really inspiring and I know this book will be filled with endlessly helpful and fun resources. I’ve always wanted to be able to play by ear! This would be excellent for myself and possibly my students!!! I would be honored to try this book and introduce it to my students as well. I would love to see this. A much needed product! I want to learn to play by ear so much. I play a lot of hymns and I hear improvisations, etc. in my head but it is difficult for me to translate what I hear into the notes my fingers need to play. I have joined a “jammin” group but have yet to meet with them. Strengthening and improving my students’ skills at playing by ear is one of my goals as a teacher. But, my own “playing by ear” skills need improvement and this book will not only be great for my students but for me, as well!! Thank you for introducing us to this new book!!! Lucinda’s ideas dovetail beautifully with the Montessori philosophy to which I turn again and again; that of helping students to help themselves by enabling them to understand the information presented through the application of logical progression. I have been lucky enough to witness Lucinda’s charismatic approach in person, and I hold her directly responsible for helping me transform myself into someone who no longer panics when faced with a piano, no music book, and an expectant ‘audience’! I can’t wait to add this terrific book to my library – thank you Lucinda! Playing by ear is something I’ve never been taught following strict classical music curriculum and, ironically, it is something I’m trying to teach my pupils along with my classical teaching experience. We do pick out tunes, harmonise, transpose… I still need more ideas and help. I’m certainly planning to study this book! I would love to look at this book. I think it would be applicable for both my students and myself! I was intrigued by this book when you reviewed it last week. I have been looking for a book on ear training to use as a reference when I am teaching. “Piano By Ear” looks like the perfect fit! I am a very auditory learner and have tried to pass my gift along to students. I believe in the philosophy of exploring the possibility of being able to hear, see and feel music. Playing by ear is essential for budding musicians as they navigate this language we call music! Playing by ear is a weak area for me. This book could be very helpful for me and my students. Playing by ear in addition to reading musical notation is a very valuable and marketable skill. It’s not enough to just play the classical works anymore. This will be a valuable resource for my students! My clever sister Lucinda wrote this book: her brilliantly realised ideas will be so useful to so many. I just wanted to say that to congratulate her … but if my comment should be the one chosen for a free copy of Piano by Ear, please choose again because I’ve already bought copies! Playing by ear is a skill I can personally use more practice on as I’m definitely a visual player. This looks like a great book to explore for not only my students, but even for myself! I will be happy to have this book! I’ve been thinking a lot about how to encourage more ear playing and improvisation in my studio. I’m excited to see what this book has to offer! I have been thinking a lot about how to encourage more ear playing and improvisation in my studio. I’m excited to see what this book has to offer! Boy this is one book I could certainly use in my studio. I am trying to incorporate more improvisation in my teaching & playing by ear would be perfect to use in this endeavor. Thanks for the opportunity to win this. I would love some ideas on how to teach playing by ear. I was taught by a teacher whose mantra was “eyes on the music”. I was never taught to play by ear or improvise, but I would like to teach my pupils to do so. It’s a brilliant book by a brilliant teacher! As many students like to try arrangements of modern pieces it would be great for them to be able to see Lucinda’s ideas to help them with this. Thanks for letting us know about this book. An invaluable resource, can’t wait to use it with pupils! This book looks amazing. I hope to use it with my students. Looks like a great resource to add to lessons. We all need variety. I wish I was taught young to play by ear. This book would be great for mine and my students learning! Oh, wow! I am really excited about this one!!! I never expected to find such a resource and I think it will be invaluable for me in my piano studio! Thanks, Melanie, for making so many teachers aware of the wonderful new resources out there that will make learning music all the more enjoyable and effective. I have begun developing an improvisation and playing by ear curriculum for my students despite never learning during my training. Am always on the lookout for new ideas to help me help my students. Right now I’m focused on Jingle Bells and Happy Birthday with accompaniment but want to help them develop the confidence to try anything they want. I have a pupil who can listen to a piece on You Tube and play it back note perfect – incredible when she struggles with sight reading. She will be taking her Music GCSE next June and it would be lovely to help her add to her talent with this book. I could really use a resource like this for a couple of my early intermediate students that I see so much potential in, but I don’t know how to teach them in a methodical way how to do this. Thanks so much for introducing this resource and giving us the chance to win it! EAR we go! A book to help you IMProvise, IMProve and IMPress! It will also have a great IMPact on your teaching! Improvise, mess around, reverse the title…read on! Use your EAR BY PIANO. Why always use your BOOK BY PIANO?! Having been lucky enough to use and see samples from this book, I would highly recommend this practical guide PIANO BY EAR. It is what we have all be waiting for! Playing by ear is a very valuable skill to have as a musician. This book is excellent. I hope to use this book to teach my students how to play by ear and improvise. Though my colleagues turn to me for sight-reading, I fell woefully inadequate with improvising. What a gift of a book. Playing by ear is a skill I have always struggled with. I encourage my students to work on performong this way and some of them are quite good at it naturally, others are very uncomfortable with it. This is a resource for me and them. Thank you for making me aware of it. Playing by ear is a foundational skill that contributes to other aspects of musicianship, such as improvising, sightreading, performing from memory and inner hearing. This resource would make an excellent addition to a musician or music teacher’s library. I would love a copy to improve my ability to play by ear for myself and my students. Playing by ear is something I always struggled with as a student, so this has become a big part of my teaching, I would love to have a copy to not only better my ear, but also to better my teaching this skill? These look amazing! I just received the book from Amazon UK and it looks perfect for a late beginner/early intermediate student. It will be nice to add this kind of exercises to my regular practice. ‘m 84 yrs old. is it too late to learn to play by ear? Also i don’t use facebook or any of these other sites (only email. I can play piano at an advanced beginner status and know many chords but have no idea how to play by ear. Perhaps this book would be useful?